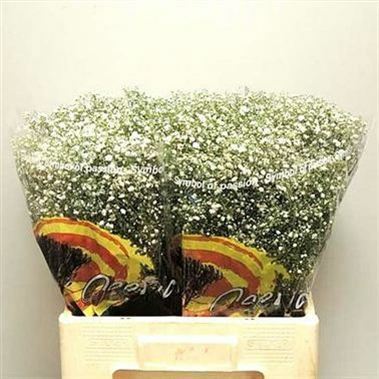 Gypsophila Pearl Blossom, also known as Baby's Breath, is a White cut filler flower - commonly used in the floristry trade to create a softening effect. It is approx. 80cm and wholesaled in Batches of 25 stems. Gypsophila, otherwise known as Baby's Breath or simply 'Gyp' in the floristry trade, is a genus of the Caryophyllaceae family. Gypsophila naturally grows on calcium rich soils including gypsum - hence the name gypsophila! It's botanical name literally means 'lover of chalk'.